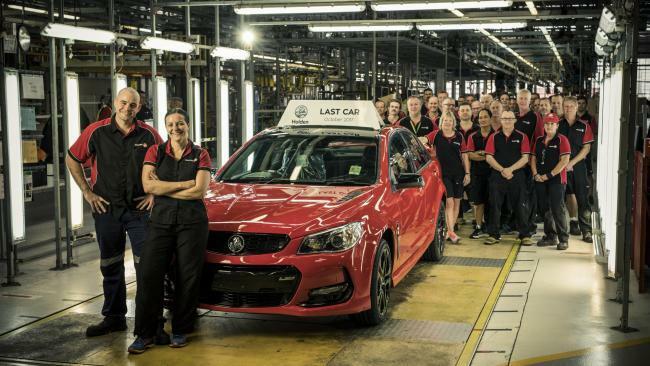 Workers with the last Holden car to roll off the production line at Elizabeth in Adelaide, on October 20, 2017. SYDNEY - The last car rolled off the production line of Australian auto-maker Holden on Friday, marking the demise of a national industry unable to stand up to global competition. The closure of the Elizabeth plant in South Australia is the end of an era for Holden, which first started in the state as a saddlery business in 1856 and made the nation's first mass-produced car in 1948. "I feel very sad, as we all do, for it's the end of an era, and you can't get away from the emotional response to the closure," Prime Minister Malcolm Turnbull told Melbourne radio station 3AW on Friday. At its peak in 1964, Holden, a subsidiary of US giant General Motors, employed almost 24,000 staff. But just 950 staff were expected to watch the final car leave the factory floor later Friday. "There are a number of people who have been here since the '70s and today will be a very emotional day for some people and a very sad day," Australian Manufacturing Workers Union state secretary John Camillo told reporters. The union blamed the federal government for causing the closure by withdrawing subsidies to the auto sector. The death of the industry was always on the cards after the subsidies were cut off in 2014. Some Aus$30 billion (US$24 billion) in assistance was handed out between 1997 and 2012, according to the government's Productivity Commission. The nation's three car manufacturers -- Toyota, Ford and Holden -- all subsequently announced they would cease production by the end of this year. The last Australian-made Ford car was rolled out a year ago, while Toyota closed its factory in Melbourne earlier this month. Among their reasons was the small size of the domestic market and competition from lower-cost manufacturing sites in Asia. "It's obviously very sad if you are an auto worker, but for the Australian economy it doesn't mean a lot," National Australia Bank chief economist Alan Oster told AFP. "The economy is very strong at present in the services area. If you go back into the '70s, (manufacturing) was 25 percent of the labour force and roughly the same numbers in terms of GDP. "Today's it's about seven percent and slightly less in terms of employment. It's a process that's been going on for a long time." Holden said that despite Friday's plant closure it would retain 350 designers and engineers and some 700 corporate staff. The last car rolled off the production line of Australian auto-maker Holden on Friday, marking the demise of a national industry unable to stand up to global competition. The closure of the Elizabeth plant in South Australia is the end of an era for Holden, which first started in the state as a saddlery business in 1856 and made the nation's first mass-produced car in 1948.